Grease or spray 2 (9x5-inch) loaf pans. Mix granulated sugar and cinnamon in 1-gallon bag. Separate dough into 10 biscuits; cut each in quarters. Shake quarters in bag to coat; divide evenly between loaf pans. Mix brown sugar and melted butter; divide mixture in half. Pour over biscuit pieces. Bake at 350°F for 30 to 35 minutes or until golden brown. Cool 10 minutes. Turn upside down; cool 5 minutes. Pipe RIP (rest in peace) on each loaf with white icing. 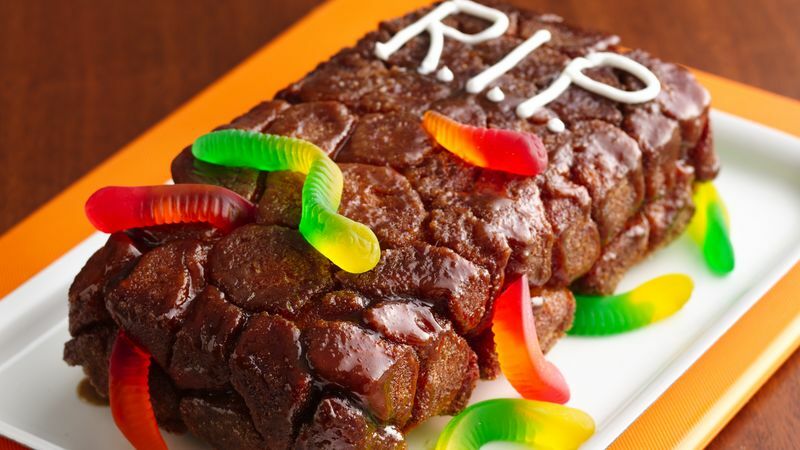 Insert gummy worms into loaves. Serve warm.